steel foil words,…advertising word and all kinds of metal welding forming. 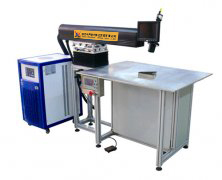 Red light to find the point of welding, CCD intuitive observation, optional microscope. Variable working platform, regardless of the size of the word can be load placed. required to focus and weld quickly. Small affected zone of thermal deformation and heat. Local heat treatment of metal word. Complex shape of the parts, small word processing available. No noise, no pollution to the environment. spot position in the font corner. Greatly improved metal word quality due to advanced processing method. LED ring special lighting lamp, no dead spot.